Legal Marketing articles describe marketing with social media in vague terms. “Start a blog”, “listen”, “create good content”. This isn’t new stuff, heck, over the weekend even the Pope told Priests to Blog. Its time to get real about social media and law firm marketing. So here are seven meaty examples of one law firm, Sokolove Law, doing its legal marketing with social media. There they go, connecting with prospects and personally building trust with visitors, while sharing the firm’s expertise to benefit the larger community. Increasingly social media is becoming central to the law firm’s websites. Parents of children with birth injuries often can’t imagine their child grown up and how they will overcome disabilities such as Cerebral Palsy. Sokolove Law’s site ChildRC is publishing a five-part series on going to college in a wheelchair. This is a totally different view of college life, which is not as accommodating as we might assume it should be. YazTalk is a socially driven website and Facebook presence that connects women with concerns about this medication with each other and the firm’s expertise. And Sokolove Law’s Melissa Hayon is a social worker who builds relationshiops through its Mesothelioma Cancer website and the broader community of those battling this disease. Naturally, social openness starts at the top. 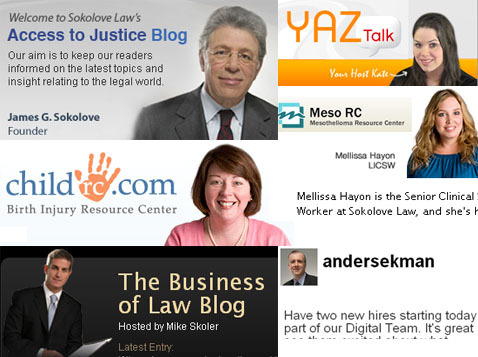 Sokolove Law’s CEO, Mike Skoler, hosts the Business of Law Blog, which the ABA recognized as one of the 25 Rebel Voices of legal blogging. You can find the firm’s officers Twittering under such handles as: @SokoloveSuccess and @AndersEkman. Taken together, the firm’s social footprint reveals its expertise and helps it connect with the people and issues that make its team passionate about legal practice. Are you familiar with other law firms with broad social media strategies? Please let me know. What firms do you think have it going on in social media? As a reminder: the opinions expressed here are those of the author, and are neither solicited, informed or approved by anyone other that myself. As an employee of Sokolove Law, I have a vested interest in this story, and am glad to share a view of the teams innovative legal marketing. 6 Responses to "Legal Marketing via Social Media: 7 Real World Examples"
Hmmmm……Dave, why didn’t you address how hard it was to get them to put a face to each of their products? I found that their fight on it makes a even better case for the companies success now. Hello.thanks for your post!|Hello.l love this website,thanks for your post!|wa,good post,i will use it alway!|hello,do you know where can find other post same this?|wa.,the 2014 world cup have coming,you still don’t have one jersey to support them?buy now!| hello,i love world cup,someone like it?|i belive england will be best this world cup in 2014!|thanks you very much,i want to buy soccer jersey right now,someone know how can i buy them?|good luck england and mexico,i love them!|who want go to look at the 2014 world cup game? You can bake a regular 2 pound loaf with the Zojirushi 2lb Home Bakery Supreme Breadmaker. great change every single day. air for years to come. For example, people with a latex allergy often have related food allergies.